Observed along a muddy road through South Nandi Forest, Kenya, April 2013. Notice that the tarsus on the third leg is pale, a character of this genus in the Americas. This female wasp is gathering mud from a wet road surface through South Nandi Forest in Kenya. The mud will be used to construct pot-shaped chambers in a spot sheltered from rainfall. Human habitations are often selected where eaves keep the mud dry. Inside the container paralyzed prey are stored by the female to be fed upon by her larvae. 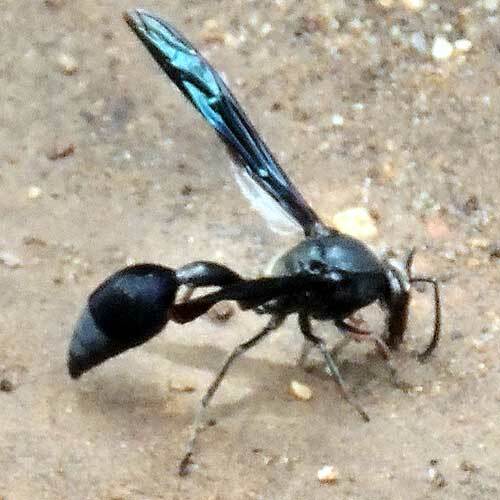 The type of prey varies by the species of potter wasp. Adult wasps take nectar at flowers.